As I’ve mentioned in a previous post, my Dad first read Lord of the Rings to me when I was about 6 or 7. 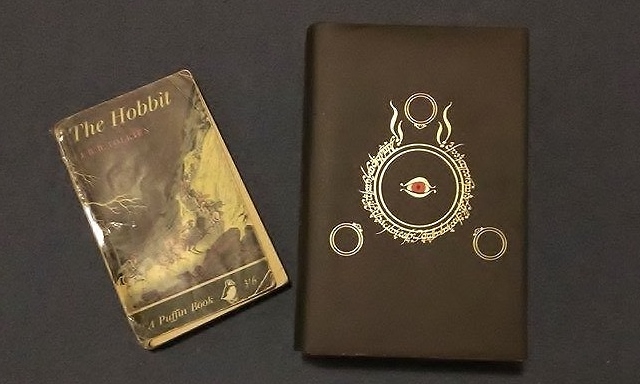 Ever since then, I’ve read both LotR and the Hobbit for myself (for my 18th birthday my grandparents got me a beautiful 50th anniversary edition of LotR) countless times. I remember the Fellowship of the Ring coming out in cinemas (in 2001, so I was 7) and I wasn’t allowed to go and see it in case I got scared. I was very disappointed and cross that I wasn’t allowed in. I knew what happened after all! My brother and I were allowed to go and see The Two Towers the following year and from then on, we were hooked. Middle Earth dominated our fancy dress (I made my mum give me Legolas hair for parties a few times and my brother and I had Black Rider costumes…), room decorations (posters, and my brother has a beautiful map of Middle Earth on his wall), games (both computer – battle for Middle Earth was great, and board games- we may or may not have LotR Monopoly…. ), music (we own the soundtracks, some of the sheet music and I have played orchestral suites for the films) and tv. I am very into fantasy films and TV and I blame Tolkein entirely. Today marks the end of an era. 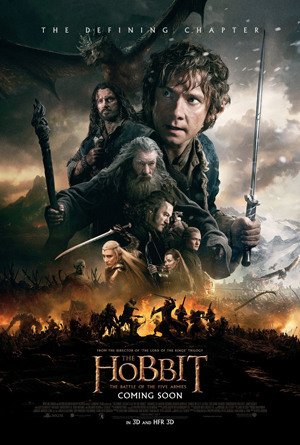 After enjoying all of the LotR films (extended versions are mandatory in our house) and the releases of the Hobbit films, I have just got back from watching ‘The Hobbit: The Battle of the Five Armies’ at the cinema. Part of me was dreading it, not because I wasn’t going to like it, but because as soon as the end credits rolled, that was the last brand new film set in Middle Earth I was going to get to see. I thoroughly enjoyed it. I particularly liked Smaug (the dragon) and the way he grew fire in his belly and was a truly horrifying monster, but still showed emotion being voiced wonderfully by Benedict Cumberbatch. The battle scenes, as always, were terrific and there were some great moments aimed at people who had seen the Lord of the Rings a few times. I particularly liked the scene where Legolas FINALLY ran out of arrows! There were some very poignant moments, and I may or may not have shed a tear… The final song by Billy Boyd was lovely and a great full stop at the end of the tale. I’ve written a post about that here. I’m turning 21 on Friday, and so finally have no excuse to call myself a ‘child’. This has been nicely marked by the end of the Hobbit. As Middle Earth no longer offers new adventures, I have to grow up, and what better age than 21 to do it (although I’m sure Father Christmas will bring the extended DVD of the third Hobbit for Christmas next year…). If you haven’t ever seen any of the films then I envy you. A small part of me wishes I could watch from the beginning of the Hobbit trilogy all the way through to the Return of the King as a new viewer. What an epic saga that would be! I’d totally recommend going to see these films, and reading the books. It’s one of the things that evolved with me through a large portion of my life and I have become a huge fan. If you’ve never visited the world of Middle Earth, then please do! It has brought me almost endless enjoyment, and you never know, it may do the same for you too. Grace Notes: Noel Nouvelet Nightmare! 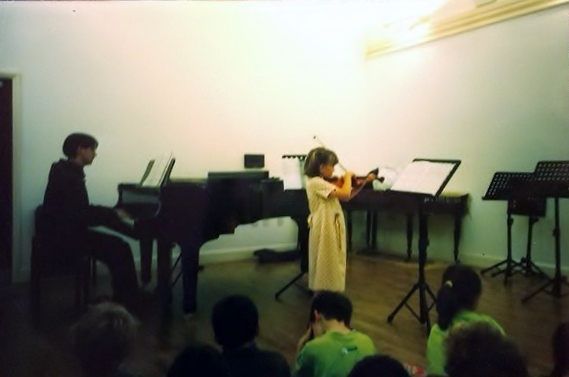 Me playing in a concert at Junior Royal Welsh College of Music and Drama in 2000. To get you in the Christmas mood for Thursday, I’d like to show you a couple of beautiful recordings of Noel Nouvelet (just because I can’t play it, doesn’t mean I don’t like it…). The piece is a French folk carol, so here it is being sung by a female trio in a traditional style. Here is a more formal version sung by the Choir of King’s College, Cambridge. I hope you all have a very merry Christmas and I’ll see you in a week or two! Grace Notes: Concert dress dilemma! 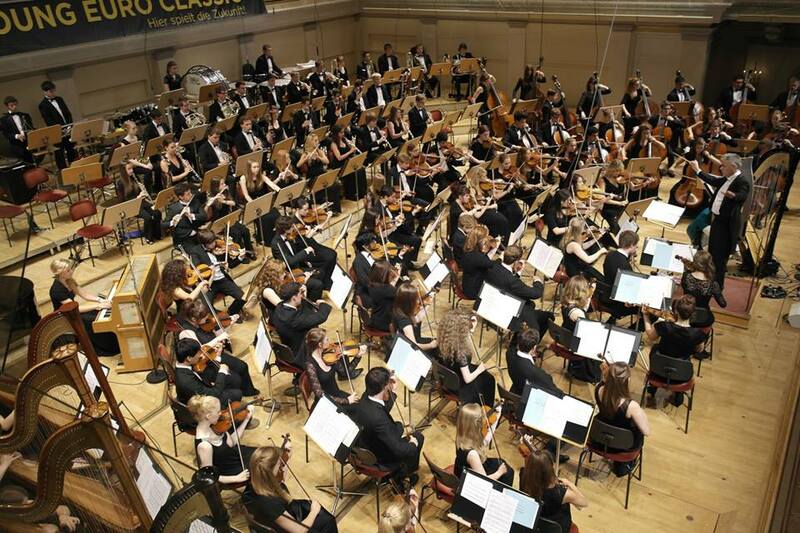 The National Youth Orchestra of Wales in concert. Floor length black is required and we all look very smart! DON’T wear a skirt that’s too short when in an orchestra. Try to keep it below the knee, and if any leg is showing, then wear black tights. It makes the ensemble look messy otherwise. DON’T show any midriff or back if the dress is all black. It looks more like you’re going to a party and again, you won’t blend in with everyone else. If the dress code is ‘long black’ then trousers should be fine (always check as some people get funny about this), just make sure they are smart ones and not jeans or leggings. If ladies can wear coloured dresses then DO make an effort to show yourself off. In this case, (again, so long as it’s floor length) it’s more acceptable to show a discreet bit of flesh (shoulders, back etc) to make yourself look more ‘glam’. DO make an effort. If you feel good in yourself, you’re likely to be more comfortable and so play better. If it’s a quartet or small ensemble gig, then shorter dresses or skirts are acceptable, although (especially in the winter) I’d personally still wear tights! I constantly have pale skin, so at a gig I’d rather people were focussed on the playing, rather than my luminous white legs. Heels or no heels? If you can walk in them, then go for it, your calves will look great! If however, like me, you have trouble walking in flat shoes I’d give it a miss. Tripping up on stage is never good (and yes, this has also happened to me.)! Discreet jewellery is fine, just don’t go too mad! There will be other occasions for your huge sparkly earrings and chunky necklaces. Again, it looks like you’re on a night out, rather than playing a nice Beethoven symphony. SMILE! Although this technically has nothing to do with clothing, you still wear a smile! When you stand up at the end, even if it couldn’t have gone any worse, smile and the audience will go away with a much better impression of you. Nothing is worse than a grumpy orchestra! At a concert earlier this year. I hope some of these points have been useful! I’ve found it helps to feel good about what you wear and in the end, it’ll improve yours and the audiences concert experience. 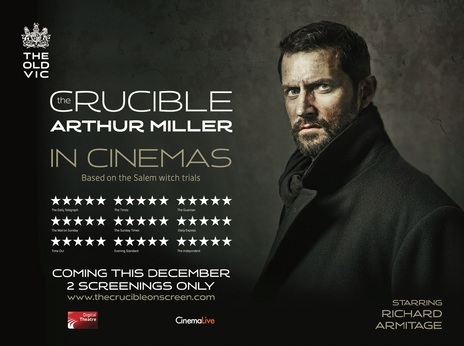 Last Thursday I went to a ‘CinemaLive’ showing of ‘The Crucible’, a play by Arthur Miller. This was a recording of when it was playing in The Old Vic a few months ago, being shown in Cineworld Cinemas around the UK. I had seen this performance advertised around London in the summer, but didn’t get a chance to go and watch, so when my Mum offered me a ticket to the cinema, I jumped at the chance. Other than the setting of the play (during the Salem witch trials) I had no idea what I was about to see. We arrived, were given a program and discovered the play was over three hours long! I was a tad hesitant, but I was totally enthralled and didn’t notice the time pass, so was surprised when it was past 11 when it ended. The cast were incredible, particularly Richard Armitage playing John Proctor and Samantha Colley playing Abigail Williams. I particularly found the possessed girls scary, because the way they were writhing around and chanting together was so unnatural. The production had next to no colour, which added to the bleak and tragic themes of the play. Almost the whole way through, the women wore headscarves so they had a very washed out look, and their faces were pale and enhanced. The scene changes were slow and almost faded into one another. There was never a definite stop in the drama and this meant that the audience were on the edges of their seats the whole time. As this was filmed, it meant that you saw the faces of the actors close-up and you could see the madness in the girls eyes, and the grief in John Proctor’s which made it even more heart-breaking and cold. The music was also very effective and for an audience at the cinema it was an integral way to draw us in. When it was performed in The Old Vic, there was incense burning in the auditorium throughout the play which would have encircled and drawn them into the trials. Watching a recording, we obviously didn’t have that, but I feel the music did the same job for the audience in the cinema. There was a constant bass hum through the whole play, giving the continuing feeling of unease and unnatural goings on. The music in-between the scene-changes was minimalist, mainly strings, piano and voices to help move the story on. The ‘CinemaLive’ events bring theatre to people who might not have otherwise had access to it (location, time, money etc.) and give them an experience that is, in many ways, more immersive and emotional than a normal film. This is my second experience of watching a play in the cinema. Last year I saw the production of ‘Macbeth’ starring Kenneth Branagh and Alex Kingston as part of the Manchester International Festival, shown in cinemas by ‘National Theatre Live’. This was also amazing and brought the ‘live’ feeling of Macbeth (minus the mud and rain that was hitting the front row) to the cinema. From seeing both of these incredible productions in the cinema I have come to the conclusion that I don’t make the most out of living in London. All around me there are plays, concerts and shows being performed and I’m just sitting at home watching ‘Pointless’ (great show though it is…). In the new year, I’m going to keep on top of this wealth of live art around me and try to see more. If you think ‘oh, but theatre isn’t my thing. I’d get bored/it’s too expensive/I don’t live in London etc’, try one of these showings and you be begging for more. Most concerts I do consist of orchestral music, usually large and occasionally with a guest soloist. I rarely have the chance to play with choirs so I particularly enjoyed this concert because not only did I get to play ‘Zadok the Priest’ (yes, you know the one) and other amazing works by Mozart and Handel, but I got the chance to combine forces with a fantastic choir. 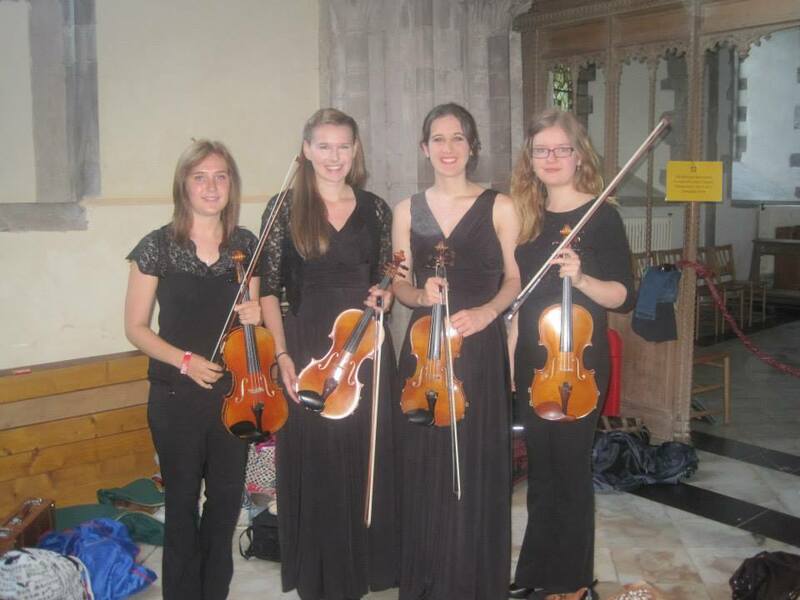 The concert was a collaboration between the National Youth Orchestra of Wales chamber orchestra (a smaller orchestra, so for example there are only 8 violins in total rather than the 32 you’d find in a symphony orchestra) and the Cardiff Ardwyn Singers . 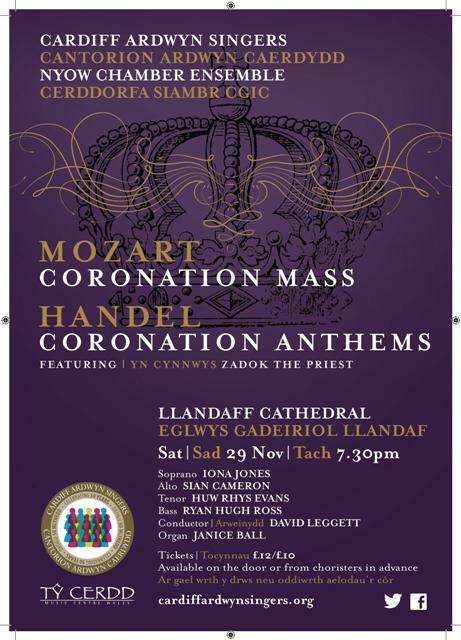 A small number of NYOW members were asked to perform in this concert in Llandaff Cathedral with the choir, doing a programme of Handel’s Coronation Anthems and Mozart’s Coronation Mass in C.
The orchestra had a rehearsal on the Friday night to have a look through the music (there was little time to meet as we were coming from all over the UK. For me, this was a nice excuse to have a weekend at home in Cardiff! ), but personally, nothing really fitted together until the choir joined us the following day. They had been rehearsing for a while for this concert and so sounded amazing. I loved the music, but the highlight for me was playing ‘Zadok the Priest’. I had sung through it in a choir rehearsal years ago when I was at Royal Welsh College of Music and Drama Junior Department but playing in the orchestra, for me, was far better than singing. It starts with quiet semiquaver broken chords in the strings which gradually crescendo for about 22 bars until, when reaching the climax, the choir come crashing in. This is such a recognisable piece and you could tell the whole audience enjoyed listening. It was a great opener to the concert. I thought, after that high, the rest of the concert went well and we continued to bring a smile to people’s faces on a chilly Saturday night. The Mozart was a short mass (only 25 minutes) but still was totally enthralling throughout the movements (it was my Dad’s favourite). I particularly liked the Credo because it was exciting to play (it’s almost all semiquavers for the violins) and had a beautiful slower middle section where the soloists got a chance to shine as the strings played descending chromatic passages. I’m really lucky to have been involved in things like this over the years which differ from the larger works I usually do. For me, playing such brilliant choral music in a space like Llandaff Cathedral shows that you don’t need a huge orchestra, with unusual instruments and fancy electronics to create a beautiful and truly engaging experience.